Most don’t understand that soybeans tend to be sensitive to planting depth. When you start out planting soybeans, not only do you want to plant them in the right conditions, but you also want to check your planter depth! According to a recent Michigan State survey, around 20% of the soybeans planted with a drill, were planted to their intended depth. The other 68% of soybeans planted with a drill were either been planted too deep or too shallow. The approximate soil planting depth for soybeans is around 1 to 1.5 inches. 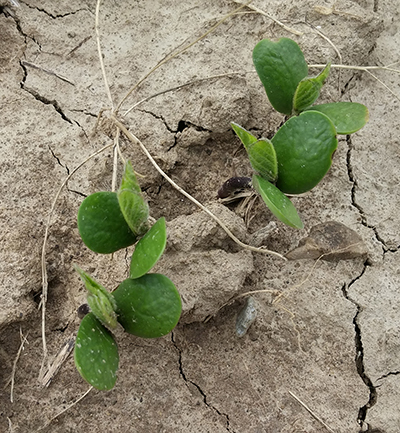 If a soybean is planted too deep, the cotyledon may be slow or not able to break through to the soil surface. In some cases, deeper planted soybeans can be more stressed under less than ideal growing conditions, and could be more prone to herbicide injury. When planting soybeans at early planting dates, within high residue, in fine textured soils and with high moisture, you should plant soybeans at around 1 to 1.5 inches. There are some instances you may want to plant deeper such as: late planting, course textured soils, and dry soils. Seed size is also a major factor when pondering planting depth. If your seed is larger, then it has more energy for the cotyledon to break through the soil surface, but if it is a smaller seed, you will really need to watch planting depth. Planters do offer better precision when it comes to the planting depth, when compared to drills. No matter what planting equipment you use, you always need to check your planting depth and be sure to always consider planting conditions and seed size for optimum yield.